The Salem Public Library Foundation Board promotes the arts and culture in Salem. We understand the joy that can come from the integration of the arts and learning. "The arts help us express our values, build bridges between cultures, and bring us together regardless of ethnicity, religion, or age.” The arts can benefit community members academically, economically, and socially. The Art-to Go collection is supported by the Salem Public Library Foundation and allows Library patrons to check-out original works of art (just like a book) for up to six weeks to hang in their home or office. The framed artwork is located on the Main Floor of the Library in glass-fronted cabinets. Choose a piece and take it home in a special protective bag! The Foundation's permanent Art Collection is displayed at the Library is curated by the Salem Public Library Foundation Art Committee. 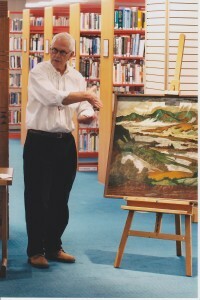 The City of Salem also displays pieces from its art collection at the Library. This collaboration promotes both organization's desire to present free public art display. Look for works from Louis Bunce, Hilda Morris, Leroy Setziol, Carl Hall, Andrew Vincent, Bonnie Hull, Eileen Cotter Howell, and James Mattingly. Recent donations include works by Charles Haney, Rodd Ambroson, Jack McLarty, Carl Morris, Don Wilson, Susan Trueblood Stuart, Sue-Del McCulloch, and Eric Wuest. A work by Ann Altman joined our collection selected from the 2018 Salem Reads art exhibit. Established in 1972, the collection's foundation was built through the purchase of artwork from the Mayor’s Invitational Art Show. Over the years there have been various donations, purchases and acquisitions. We continue to welcome donations to the collection which meet our criteria. In the coming year, generous donors will welcome a work of art from Nancy Lindburg, a former Foundation board member and icon in the art community, long missing from our collection.